Crossover SUVs have filled a void you never realized existed. Perhaps you like the modest size and maneuverability of a car, but also appreciate the raised seating height and extra cargo space and power found in an SUV. In the past, you would have had to choose between one or the other. That is no longer the case. With the 2016 Ford Edge near Brainerd MN, you can experience a taste of both worlds in one stylish package. Crossover SUVs are just what they sound like - a cross between an SUV and a car, allowing for a more versatile experience behind the wheel. 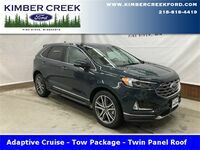 Sitting at the helm of the 2016 Ford Edge, you’ll be in command of a bold vehicle that allows for more fuel efficiency than you might expect from an automobile this size. The standard engine gets up to an estimated 20 city miles per gallon and 30 highway miles per gallon. Those numbers were unheard of for vehicles of this size in the past. Read more: Ford is adding four new SUV nameplates to its global lineup. The 2016 Ford Edge has three different engine options. The Twin-Scroll 2.0-liter EcoBoost engine is designed for efficiency. The 3.5-liter twin independent variable camshaft timing (Ti-VCT) V6 engine boasts a performance of 280 horsepower. The Sport trim comes equipped with a 2.7-liter V6 engine that delivers a pulse-pounding 315 horsepower, and it has bragging rights as the most powerful gas V6 engine in the Midsize Utilities class. All of this power, and the Edge looks good, too. Contact Houston Ford and schedule a test drive today.